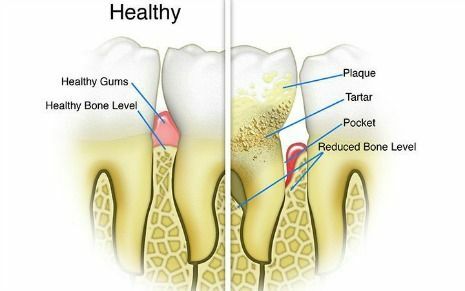 Plaque VS Tartar: What is the difference? “What’s the difference between plaque and tartar?” is a frequently asked question. Patients often think they’re the same thing. And they are kind of— but not really. Let me explain. Plaque is that soft, sticky film (harmful bacteria) that builds up on your teeth and under your gums throughout the day. Fortunately, harmful plaque can be easily removed during, twice daily, tooth brushing and flossing. Any plaque that’s missed while brushing can cause our gums to become inflamed, appear red and puffy, and cause them to bleed more easily. When this happens, this is called gingivitis. Gingivitis is a reversible stage of gum (or periodontal disease) disease. Gingivitis left untreated can lead to advanced stages of periodontal disease and even tooth loss. If plaque is left on your teeth for too long, it will harden and become calcified. Tartar is calcified plaque and is also commonly known as calculus. Tartar or calculus is not easily removed during tooth brushing and flossing. In fact, only a dental professional can remove tooth tartar. And tartar removal is one of the reasons why the American Dental Association recommends you to have your teeth professionally cleaned and examined by a dentist every six months. The primary difference between plaque and tartar is its age and how easy (or not) it can be removed from the surfaces of teeth and gums. Loosely attached plaque eventually hardens if not removed. Effective tooth brushing and flossing can remove dental plaque from teeth surfaces, whereas, tartar or calculus can only be removed by a dental professional. It’s worth repeating here how important it is to brush and floss daily. 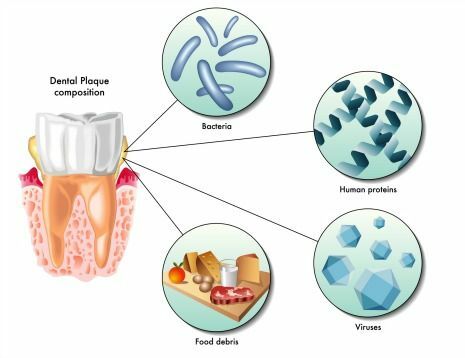 How does dental plaque form? When you eat—especially carbohydrates or sugar—mix with the saliva (containing bacteria and germs) in your mouth to produce an acid. Over time, frequent and repeated acid attacks on a healthy tooth will impact the strength and integrity of the outermost layer of a tooth known as tooth enamel. 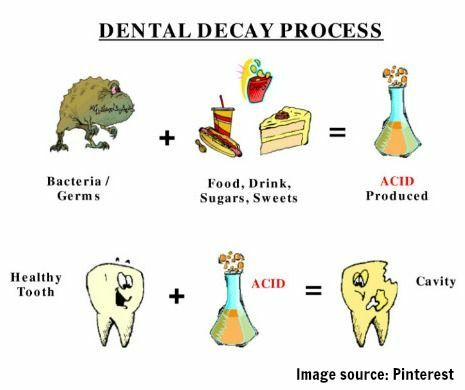 The higher number of acid attacks tooth enamel is exposed to, the greater the risk teeth have for developing a cavity (tooth decay). Tooth decay is an irreversible condition that requires a visit to your dentist for a restoration. 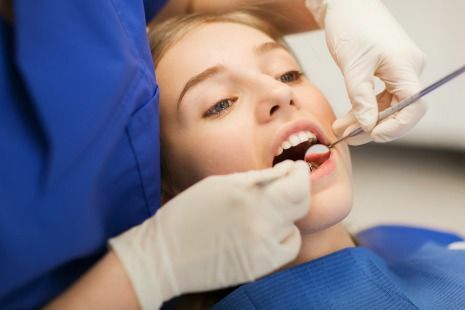 Left untreated, tooth decay will eventually progress to the innermost layer of the tooth containing the nerve and become quite painful until resolved. There is no known cure for tooth decay. What does plaque look like on teeth? The appearance of plaque in the mouth varies person to person. Generally speaking, plaque appears in varying shades of yellow-brown. The variation in color of a person’s plaque is dependant upon a person’s diet, overall health, and effectiveness of one’s daily oral health care practices. Pictured right is a before and after picture of a person who had their teeth professionally cleaned. If you look closely in the before picture, you’ll notice how the gums appear red, puffy and irregular in shape. This is because the plaque was not removed and hardened into tartar. The after picture shows a marked difference in the appearance of the teeth following a professional teeth cleaning. PS. The bleeding you see in the after picture is residual bleeding from the inflamed gums. If we were to take another follow up picture within 24-48 hours, you would no longer see any bleeding. Instead you would see the gums to be light pink-coral in color and no more puffiness or swollen gums. Several studies have shown that electric toothbrushes when used correctly remove plaque and food debris than using a manual toothbrush. 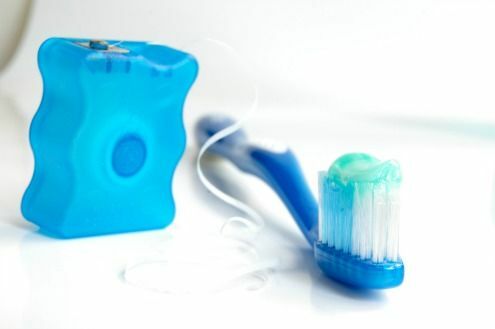 String floss is not your only option for cleaning between teeth. For there is a wide variety of dental “toothpick” styles to choose from. Our favorite are soft picks by Gum. They are single use, flexible, and available in different widths. Their flat handle and compact size make it easy for men to keep a few in their wallets and for women to carry in the purse. Waterpiks are another great option that research has shown to be almost as effective as traditional string floss. A waterpik has multiple tips and settings that help you to effectively remove food debris between your teeth and gums. Don’t forget to clean your tongue too! There are a variety of tongue cleaners and scrapers available that clean the top surface of your tongue and cheeks better than toothbrush bristles. It’s inevitable that there will be plaque left behind following tooth brushing and flossing. Vigorously swishing with an antibacterial mouthrinse for 30 seconds will help to reduce the potency of left behind plaque. 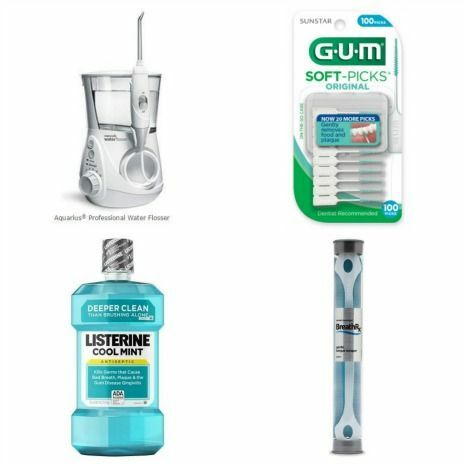 Popular antibacterial rinses include Crest Pro-Health and Listerine. Look for an alcohol-free variety if you suffer from a dry mouth. Alcohol-free varieties are also recommended for kids. Chewing gum that contains Xylitol has shown to help reduce the formation of plaque and can help reduce the severity of an “acid attack”. People who are sensitive to sugar alcohols should avoid using Xylitol products. 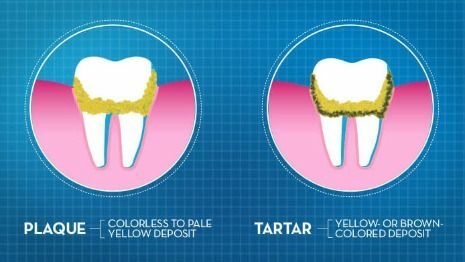 What happens if plaque and tartar are not removed? If not removed, plaque and tartar will inflame teeth and gums causing your mouth to become very sore and make it increasingly difficult to chew comfortably. Plaque is a harmful bacteria that accumulates on the surfaces of teeth and gums. If not removed, plaque migrates downward on the tooth till it reaches the bone that holds your teeth inside the jawbone. When this happens, you have a non-reversible condition called periodontitis (commonly known as gum disease). Additionally, the presence of acidic plaque on teeth surfaces impacts the integrity of tooth enamel. Weakened tooth enamel is at an increased risk for developing tooth decay (dental cavity). Tooth decay is not reversible and requires the placement of a restoration from a dentist. Call Dentistry for the Entire Family at (763)586-9988 to schedule a professional teeth cleaning and exam today. ← What is tooth decay and why is it a problem?